A week or two ago I went down (or is that up?) to Cambridge for a one-day conference called TheAlchemical Landscape, an event organised by Evie Salmon and James Riley of the Counter-cultural Research group there. It was mentioned in a Guardian article by Robert Macfarlane about the ‘eerie’ quality of much contemporary writing about the English landscape, an article which enumerated a considerable amount of texts I’ve been interested in lately, from JA Baker’s The Peregrine (now quite widely cited in this regard) to Ben Wheatley’s A Field in England. It was noted at the conference by Alastair Reid that there was a strong Essex connection at the conference, and in particular he noted that several Essex boys had (like myself) drifted onto ‘Celtic’ territories and pre-occupations. Whether Wales and Welsh is Celtic or not I’ll leave for another time, but the re-imagination of Essex and the Essex landscape in the work of Justin Hopper (in Public Record), in Robert Macfarlane’s Silt, in Rachel Lichtenstein’s Estuary:Working Lives project, in the work of Ken Worpole and Jules Pretty indicates that the county of my birth, which I once thought a place where nothing much happened, has become the site of a re-contestation of what living in a particular place might mean. I gave a talk about Alan Garner and his novels Thursbitch and Boneland. Garner proposes a form of ‘sentient landscape’ in both novels, in which the land is deeply implicated (through and across time) with imagination, ritual, death and loss. Both novels range across history. Thursbitch connects events of the 1750s with the present day, siting this connection in a ‘valley of the demon’ where the landscape is immanent with strange powers. Boneland also has a double narrative. Colin Whisterfield, grown up from The Weirdstone of Brisingamen (1960) and The Moon of Gomrath (1963), now a Professor of Astrophysics associated with the nearby Jodrell Bank, lives alone and attempts to recover his lost memory, caused by the traumatic separation from his sister that happens in the earlier two books; an unnamed Neolithic male, through ritual and cave-painting, tries to bring forth other beings into the world upon the loss of his female partner and child. I find both novels fascinating, but Boneland in particular, with its connection of science (fiction) with myth and ritual, and its symbolic use of the Jodrell Bank radio telescope, seems to fit in with recurrent images and tropes in the ‘eerie’ forms identified by Macfarlane. In particular, I’m thinking of the connection between the Neolithic and television science fiction that has a particular investment in landscape: the HTV children’s series Children of the Stones (1977) and Nigel Kneale’s Quatermass (1979), the latter using both radio telescope dishes (built specifically for the programme) and stone circles as key visual motifs. 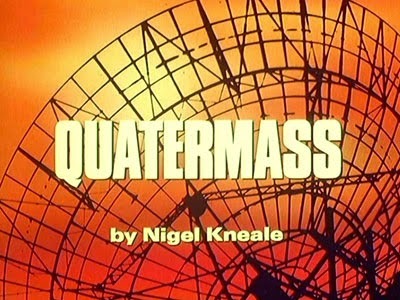 Kneale, of course, has a long history of bringing together sf and Gothic / ‘eerie’ elements, in the Quatermass narratives and in The Stone Tape. Boneland seems to me to be strongly in this tradition, moving away from the more strictly fantasy elements you find in the Weirdstone or Moon of Gomrath. Last week we visited Jodrell Bank, and it was an extraordinary place, out in the middle of the Cheshire plain. 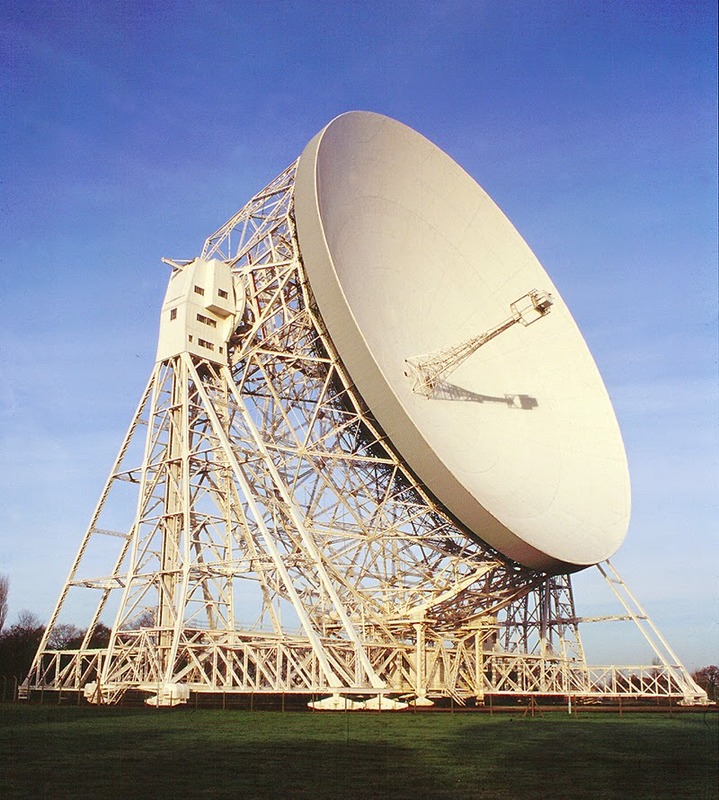 The Lovell telescope pointed straight up behind us, we used the ‘whispering dishes’ (acoustic mirrors, something I’ve long been fascinated by) to speak to each other across space; in the radio silence, I envied the people who worked with the telescope, looking out into the skies. (In fact, I’m considering buying our own optical telescope, as we live in in the North Wales countryside with unpolluted skies.) Garner implies, of course, that what Colin Whisterfield does at Jodrell Bank is simply a technological version of what the Neolithic man enacts in his cave paintings: rituals in which sky and land come together in a spatio-temporal conjunction, enabling the watcher (or shaman) to see. The visionary aspect of Garner’s work, in multiple ways, also connects him to what Macfarlane identifies as the ‘eerie’ mode, but also to the more esoteric forms of writing about the British landscape, from Alfred Watkins to John Michell. 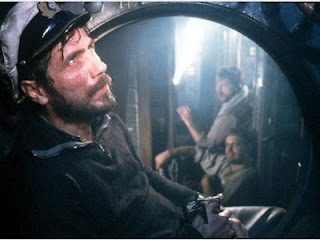 I come at this partly, of course, through my own Sinclairian interests; I didn’t quite give enough weight the extent of his embeddedness in that mode when I wrote a book about his work, though. What Garner also investigates is male trauma. When Alastair Reid mentioned ‘Essex boys’ he also put his finger on the strong gendering of the presenters and audience at The Alchemical Landscape, most of which were (white) men. In my own paper, I half-consciously revisited some of the emphasis on masculinity and trauma that I was working through in my most recent book on Contemporary Masculinities, as well as re-igniting my interests in the relation between literature/film/culture and place, and in particularly the spaces of Essex and of North Wales. For Garner, the conjunction of land and sky involves an articulation of masculine fertility (particularly in Thursbitch), where the symbol of the Bull, as constellation, ‘demon’ and sacrifice, is central. The connection between science fiction (or science fantasy, I suppose) and (eerie) landscape presents itself in the coming together of two of my recurrent interests. I noticed that Macfarlane didn’t mention Simon Reynolds and his work on hauntology in contemporary music (and although Macfarlane does mention Mark Fisher, it’s not in relation to K-Punk), nor Ghost Box. As Reynolds and Fisher identify, The Advisory Circle, The Focus Group and Belbury Poly also work with this imaginary, combining uncanny folk with early electronic music. Belbury Poly’s name, of course, refers to CS Lewis’s That Hideous Strength, a novel at the science fantasy/ planetary romance end of the ‘eerie landscape’ mode, which reads the ‘occupation’ of the English landscape by malign forces in an overtly theological (and Grail legend-inflected) mode. I recently wrote a bit about this novel in a large collection of articles about the occult. But the figuring of occult or ancient forces in the landscape, a recurrent motif in the work that I’ve mentioned so far (and which Macfarlane identifies, particularly in the ghost stories of MR James) can signify a much more material occupation. One other place we’ve been to over the past few weeks is Lake Vyrnwy in mid-Wales. 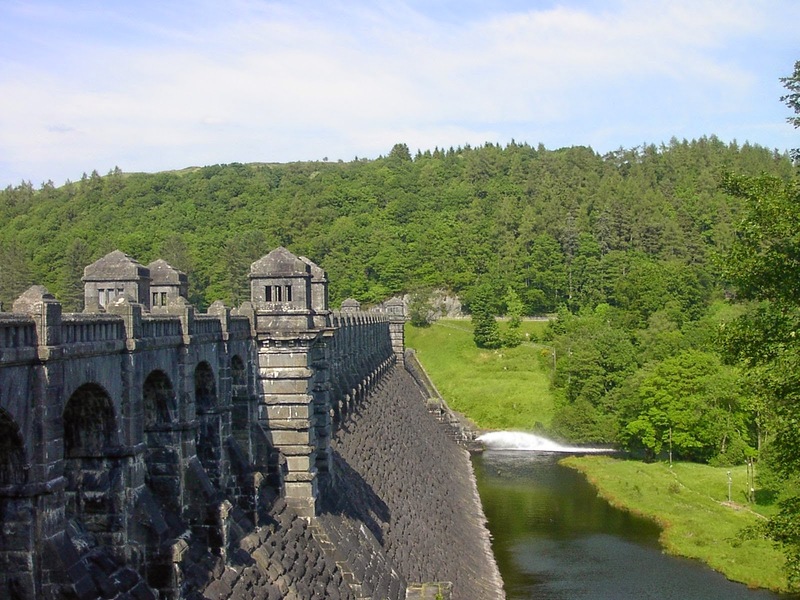 Like the more famous (and more recent) case of Capel Celyn, the drowned village north-west of Lake Bala, Vyrnwy is a man-made lake, created at the behest of the Corporation of Liverpool, which displaced a village in the name of providing Liverpool with fresh water. Lake Vyrnwy was constructed in the late 19th century, and so does not figure in the cause of Welsh nationalism as does Capel Celyn. But when we visited the dam, built of massively imposing slate, reared up like the walls of a prison. The water of the lake was black. Both my wife Deniz and I felt deeply uncomfortable in this place, not just because we are incomers to Wales (though I have lived there for 15 years now, and Deniz over 20). There felt something malignant at Vyrnwy, something wrong. For all the RSPB softening of this English imposition on Welsh lands and its marketing as a leisure destination, we could not look on this black lake as something other than a symbol of power, of displacement, even of ‘evil’. We felt the political decision to fill this valley with water for Liverpool as an act of occupation, something monstrous, a desecration of sorts. After a quick cup of tea, we left in a hurry, the inky shadows of the lake at our backs. A loose but substantial body of work is emerging that explores the English landscape in terms of its anomalies rather than its continuities, that is sceptical of comfortable notions of “dwelling” and “belonging”, and of the packagings of the past as “heritage”, and that locates itself within a spectred rather than a sceptred isle. It is unfortunate, then, that the example he uses of Garner is The Owl Service, which is deeply invested in the particularities of the Welsh landscape and of the Welsh literary tradition, notably the Mabinogion. (At The Alchemical Landscape, Sharron Kraus spoke movingly about how the landscape of mid-Wales inspires her music; Macfarlane could also have mentioned the music of The Lowland Hundred, also Aberystwyth-based, whose singer is the erstwhile Sinclair scholar (and son of Essex) Paul Newland.) As an incomer to Wales, I am deeply aware of the political implications of being an ‘Essex boy’ in this land, and do not seek to appropriate it as more meaningful from the one I left at age 18. Indeed, I keep returning to the images and histories of Essex, as much as I am interested in investigating the stories and myths and landscapes of the Vale of Llangollen. But I am worried by this use of ‘English landscape’, even if it marks a mode of writing, art, film and music which contests official histories and spaces. Mafarlane also cites Paul Kingsnorth, whose The Wake surely points out the contested constructions of what ‘English’ is or might be. The English are themselves incomers, one of the waves of settlement that has marked the history of the British Isles over thousands of years, and the landscape reflects its multiple occupations, from Neolithic standing stones to the architecture of the Industrial Revolution to roads and new housing developments. It is my own experience of uprootedness rather than belonging, displacement rather than dwelling, which is surely characteristic of life in the British Isles, and I suppose that the mode of the ‘eerie’, with its haunted subjects and landscapes, reflects that unbelonging. It is worth noting that Macfarlane also somehow manages to incorporate H.P. Lovecraft while neglecting Arthur Machen; this emphasis on England and Englishness (also present in Kingsnorth's own Guardian article last month) always ends up obscuring a host of influences and connections that incoveniently cross national boundaries. One could easily extend this discussion to eerie Wales or eerie Scotland (John Burnside?) without resorting to such petty and artificial divisions. I agree entirely. I did think of Machen but forgot to mention him. Thanks for commenting. I guess. I don't really accept the formulation that our elected representatives are, in fact, better-informed than us most of the time. And yes, I believe that even though sometimes these referenda don't go my way. I am in almost no way a conservative and yet I really like the William F. Buckley quote that went something like "I'd rather be ruled by random names from the phone book than by the faculty of Harvard University." Science fiction is regularly accused of credulous technological positive thinking and historical amnesia.Be that as it may, for present-day Californians battling with an extensive variety of environmental and social problems,science fiction may very well give the point of view we have to effectively rotate from the boom times of the twentieth century to the untidy prospect of the century ahead.